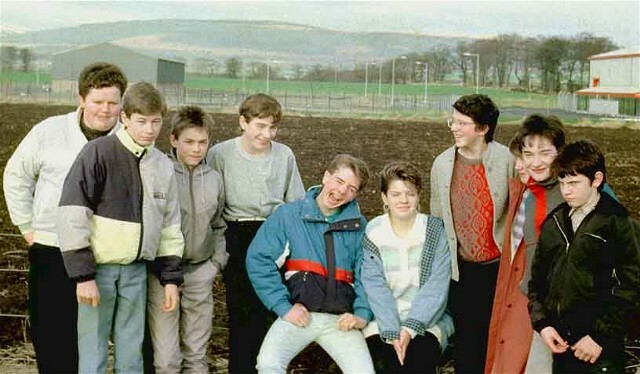 Left to right: Paul Dunbar, Chris O'Brien, ?, ?, Donald Mackenzie, ?, ?, Donna Hogg, ?, Tommy Forbes. Left to right: Paul Dunbar, Chris O'Brien, ?, Mathew Walker, Donald Mackenzie, Mandy ?, Lorraine Black, Donna Sutherland, Paul Legge and grumpyface myself. The lad between Chris and Mathew - can't remember his real name but was known as Flipper. Paul Dunbar, Chris O'Brien, Brian Rae, Matthew Walker, Donald Mackenzie, Mandy Finlayson, Lorraine Black, Donna Sutherland, Paul Legge and Tommy Forbes. I stand corrected. The lassie in the middle is Amanda Barrow. Pretty sure they are both on Facebook Amanda. Hi Amanda, am sure Mandy married Donald! I will get his number for you and forward it on. I think we are all getting to an age when we should be look at organising a school reunion, what do you think? Tommy, I think you are right, I am sure that Mandy and Donald got married. Well that was a blast from the past.